With the blessings of peace. We are writing this letter upon hearing of the detainment of Shaykh Rayd Salah, a guest in the United Kingdom coming from the Holy City of Jerusalem-Kuts. 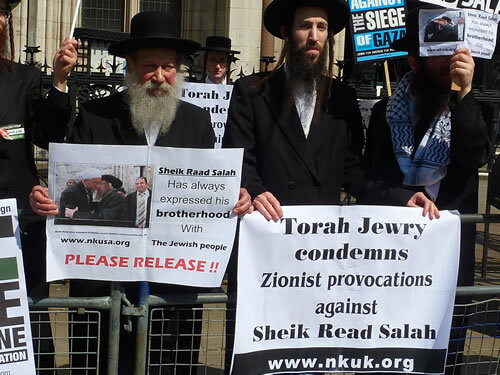 With the help of the Almighty, we, as religious Jews residing in Jerusalem as neighbors and acquaintances of Shaykh Rayd Salah feel the demanding necessity and critical urgency to speak up and voice our concern and appeal for the immediate release of the good Shaykh and the restoration of his freedom throughout the U. K., with the help of the Almighty. May we humbly state that we feel and see that at the present time in our history there is an unfortunate misreading of the will and feelings of entire peoples, especially in the Holy Land and its neighboring regions. Jews and Muslims have been coexisting in harmony in Palestine for at least many hundreds of years. Jews have likewise lived in Muslim countries enjoying their most gracious hospitality and in many cases, their safe haven throughout their long history. This all went on without a United Nations or Human Rights groups to protect the Jews. Their protection was not necessary because contrary to the current prevalent popular portrayal - there is not a religious conflict between Muslims and Jews, or an ingrained hate between the two. This portrayal of animosity is the creation of a relatively new political ideology called Zionism. Zionism is the transformation of the religion of Judaism from spirituality, humbleness, and subservience to the Almighty – into a base materialistic ideology of nationalism and freedom from and removal of, the Almighty from the root equation. In the present reality, Zionism has taken the land of Palestine, the Holy Land, from the indigenous populace, the Muslims, Christians and Jews, with little and no regard to their feelings and acceptance of this foreign rule over their land, homes and lives. History absolutely contradicts this mockery and vile, despicable claim. Religious difference has no place in this instance. Religion is only being used as a front and excuse for a terrible miscarriage of justice and an illegitimate abuse of whole peoples. Thank the Almighty, Shaykh Rayd Salah is one of the blessed individuals who has stubbornly held his stance and has not been drawn and trapped into this Zionist ploy. He has constantly expressed and portrayed his friendship and warmth for the Jewish people. Shaykh Rayd Salah has openly and in public embraced us of the Jewish faith. He has courageously stood in brotherhood with Jews and has shown himself to be a true friend of peace and coexistence with all. This in the face of possible accusation of being a traitor and friend of the enemy, the occupier. Yet, he felt the necessity to speak the truth and set an example: to show the world that Muslim and Jew have, can and must be brothers and coexist in harmony and brotherhood; that the only objection is to Zionism, the illegitimate nationalism and occupation of the Palestinian people and their land. Shaykh Rayd Salah is a peace loving man and his detainment will only stoke the fire and accomplish the evil insidious plans of driving deeper, a wedge and animosity between Muslim and Jews both in the U.K., the Holy Land and elsewhere. 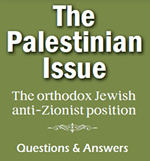 It is this that Zionism wants, to show that the efforts of courageous men as the Shaykh, men who have stood up and embraced Jews are all a farce; that in truth their objections and speeches and cries of pain in regard to the suffering of the Palestinians is simply a facade to cover hate and anti-Judaism, Anti-Semitism. Then the future is, heaven forbid, hopeless for our coexistence and return to brotherly love. Please, we appeal to your compassion, not only for the good Shaykh, but for the future of us all - The rebuilding of bridges, and repairing of torn hearts of both our people. The future of the Muslim and Jewish communities lies presently in the scale of justice, will the pressures of certain interests prevail and put into perpetuity the tragic continuing mistrust and hate or will a courageous judge and leadership say no to this evil and finally reverse this horrific trend. We have lived in the past in brotherhood and harmony and with the help of the Almighty, will do so once again soon in our days. We humbly plead with you, "Free this Good Shaykh!!"